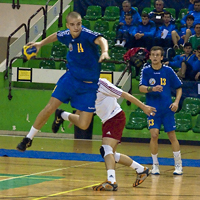 07.11.2011 - The Moldovans win Group B of the IHF/EHF 2011 Men's Challenge Trophy on 4-6 November 2011 in Msida, Malta. 07.11.2011 - The Faroese win Group A of the IHF/EHF 2011 Men's Challenge Trophy on 4-6 November 2011 in Limerick, Ireland. 03.11.2011 - Over the upcoming weekend two tournaments in Malta and Ireland will decide two finalists out of the eight participators. 19.09.2011 - Eight teams will be participating at the tournaments in Malta and Ireland on 4-6 November 2011.